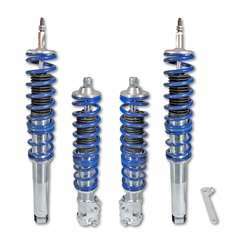 Hardness and height adjustable coilover kits, 16-point hardness adjustable, TÜV-adjustment range from 20 to 60 mm for a perfect road holding in every situation. Always a good feeling ! With the exclusive performance-control screw you choose between 16 individual hardness degrees from eXtremly sporty to comfortable. High quality and reasonable price as a matter of course! The BlueLine coilover suspension kits are highgrade car-specific suspension components. The range of adjustment gives an individual body lowering. The kits have a huge transverse force absorption. The initial spring tension survives in complete range of adjustment. Adjustment after installation. Car-specific versions: front thread / rear spring system. 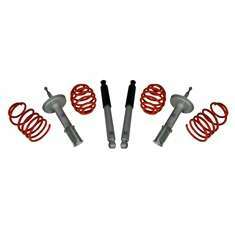 JOM complete suspension kit for sportive cars! Exactly calibrated suspension components working perfectly in every driving situation. 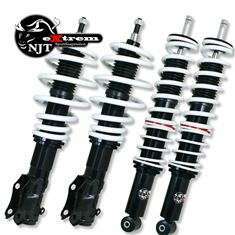 JOM offers high quality car specific suspension kits for lowerings from 30 to 60mm. The kit includes front and rear springs and shock absorbers.